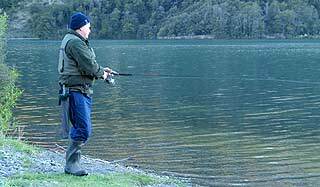 Spin fishing is permitted on Lake Selfe and is a leisurely way to while away the hours. Vegetation to the water’s edge can make the fly rod difficult to use in some places. There is nothing worse than having your back cast swallowed by dense matagouri bush! 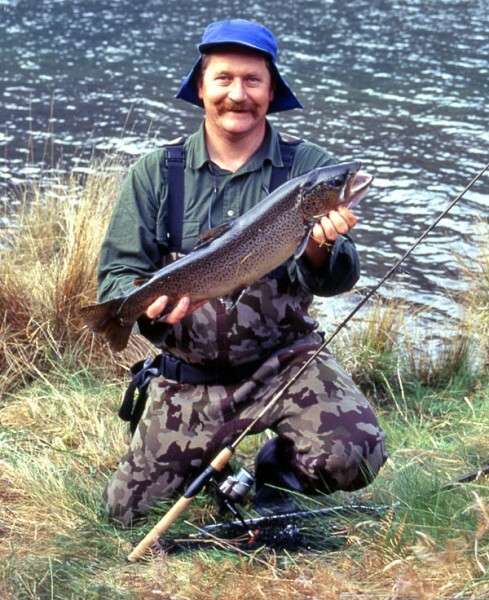 Lake Selfe trout fishing takes place in what must be the most picturesque lake in the region. 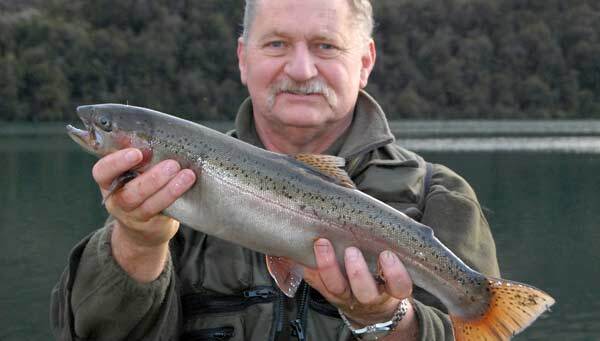 This lake together with nearby Lake Georgina, have been stocked by the North Canterbury Fish & Game Council with rainbow trout from the Ngongataha hatchery, in Rotorua in the North Island. Fishing other waters of the Lake Coleridge group. These R-Strain rainbows grow faster and spawn at an older age than normal rainbows. 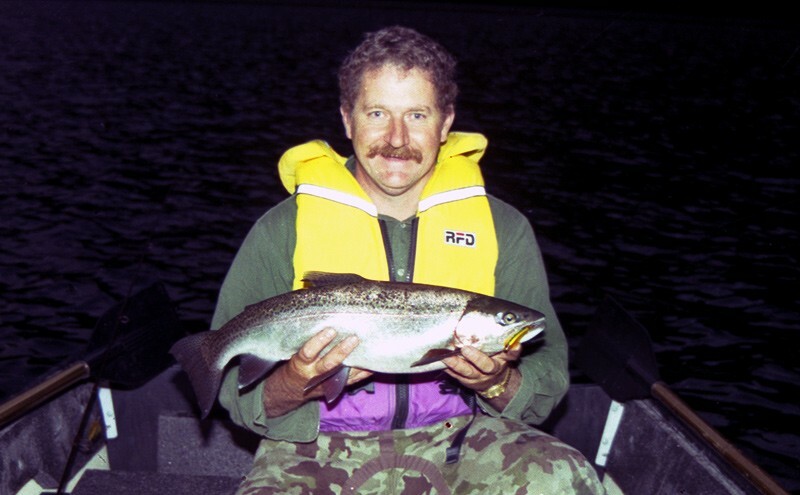 Allan Burgess with a rainbow trout from Lake Selfe. 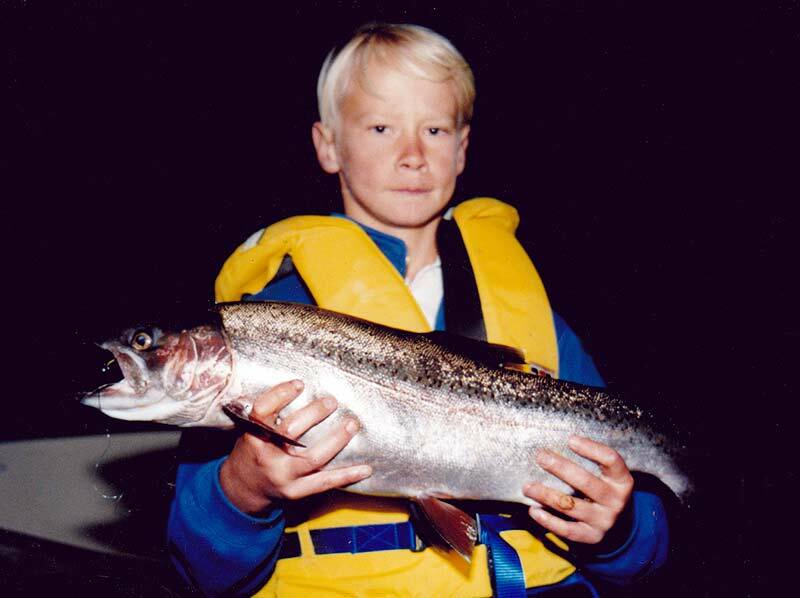 Fish released in 1995 were averaging 1.5kg at age two and a half years. If these growth rates continue it is hoped that anglers will be able to catch fish up to 2 to 2.5kg this coming season. Should this, in turn, be successful there could be some big four-year-old fish in these lakes by next year. At either end of lakes Selfe and Georgina there are green boxes attached to sign posts which hold question forms that anglers are encouraged to fill out and return when fishing the lakes, whether or not you catch any fish. The R-Strain rainbows have been fitted with a tiny plastic disc tag held on by a loop of stainless steel wire just behind the dorsal fin. Anglers are asked to record the numbers from the tag of any fish they catch and release. Please leave the tag in place when you return the fish to the water. 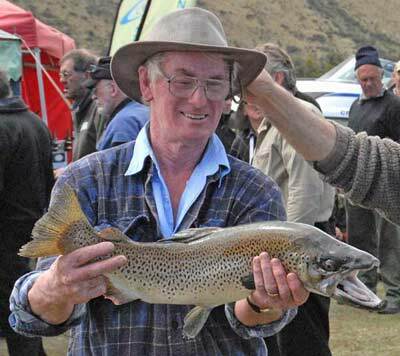 Bluey Walker landed this 3.020kg brown trout from Lake Selfe to win the prize for the heaviest fish caught and weighed during the Fish & Game Opening Weekend Competition 2009. There are some big fish in this lake but they can be sneaky and difficult to catch! Fish around 3 kg are about the size limit in Lake Selfe. If you decide to kill the fish, cut the tag off and return it, with the completed form from the box, to North Canterbury Fish & Game, 3 Horatio Street, Christchurch. There is a 2 fish limit on lakes Georgina and Selfe. Both lakes are fly and spin waters. I found the tags very small and difficult to read, though in late August the water in Lake Selfe is not much above freezing and the old legs get very cold when you stand waist deep for any length of time, even in heavy Neoprene Waders. This cold tends to dull the senses a bit! 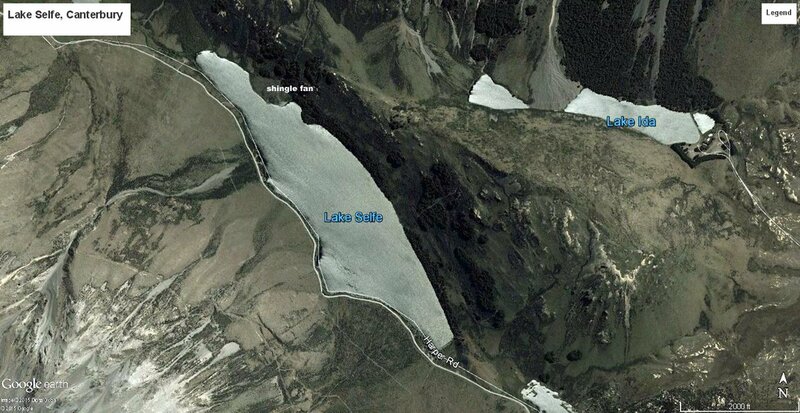 It is quite possible to fish the shoreline of Lake Coleridge and Lake Selfe without the need to get your feet wet at all. This is particularly true if spin fishing where you don’t have to worry so much about where your back-cast is going. If you are going to practice catch and release I suggest a magnifying glass would be a big help for reading the tags. 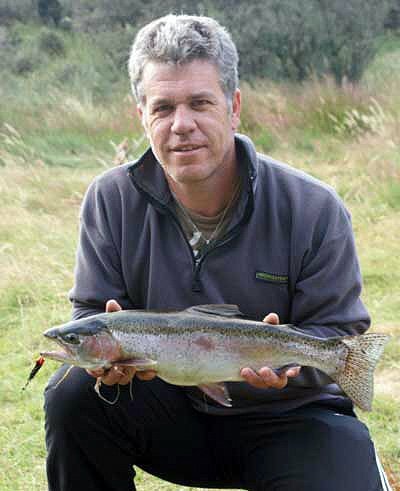 Lake Selfe rainbow hen trout caught on a Johnson’s Kobra lure. 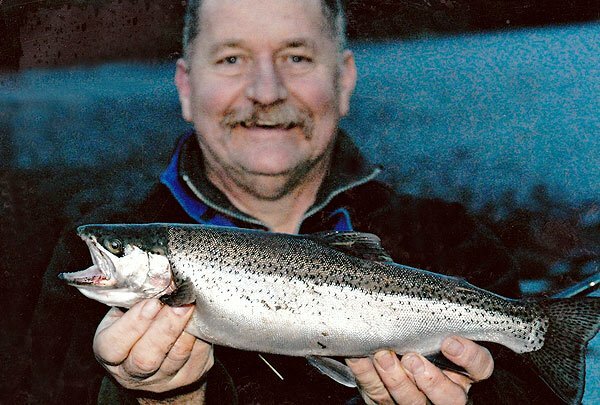 This method is just as popular as using the fly rod on Lake Selfe. We used Cobra spinning lures to good effect. The best colours seemed to be yellow and orange fished on 4 to 6 lb line. 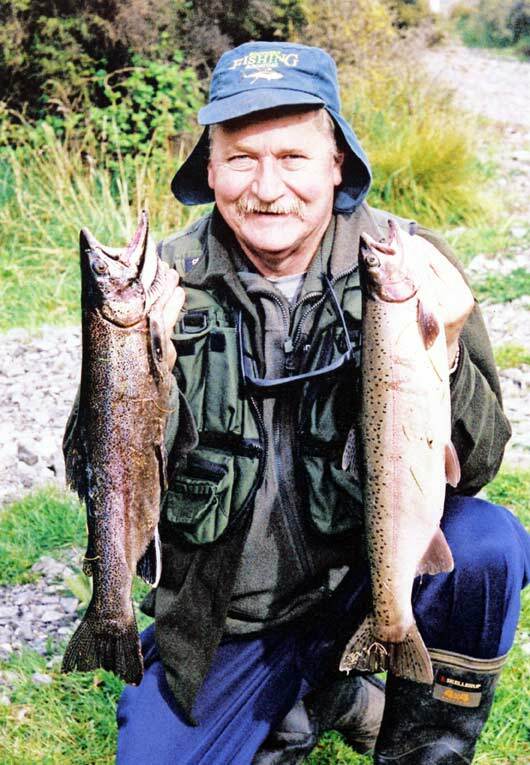 The water is usually very clear and trout will often follow your lure to the bank. 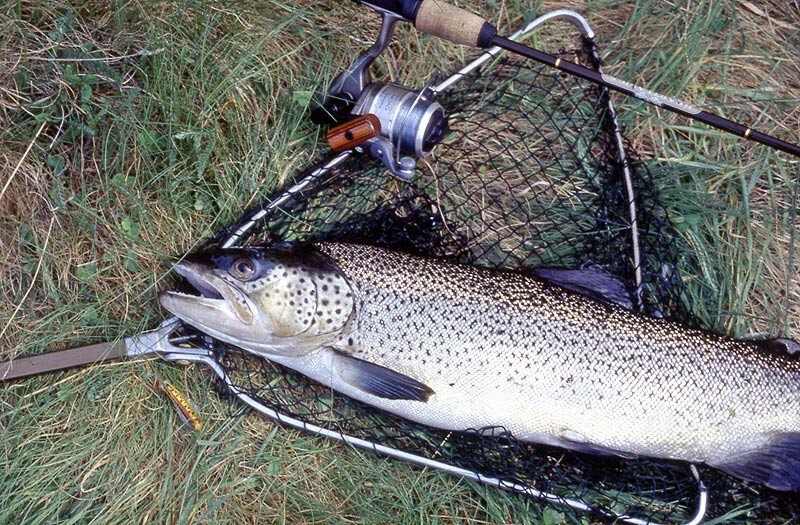 A net is needed in many places to lift fish in difficult spots lacking shallow water. Looking west along Lake Selfe on Opening Day 2009. Selfe is perhaps the prettiest lake in the Coleridge group but the wind can be trying. Dust clouds to the left of the picture have been whipped up by vehicles on the shingle road. Early morning and evening are the best times to fish. On opening the rainbows they were found to have eaten nothing other than quite large green cicadas, so perhaps a small green Cobra might also have been effective, as would a similar imitation on the fly rod. 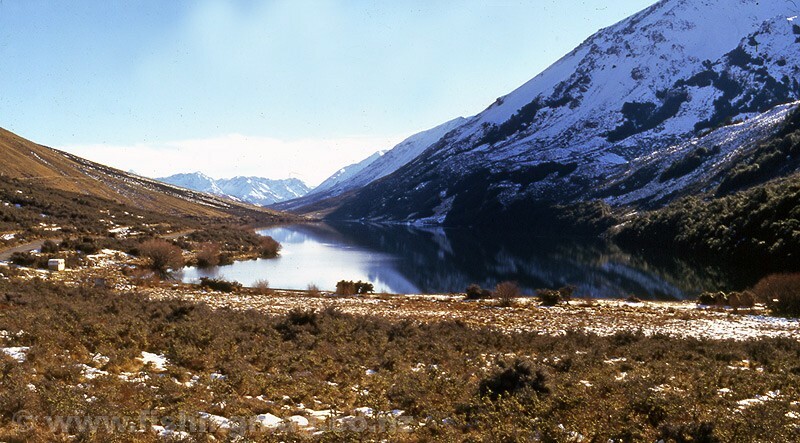 Lake Selfe has thick bush and Matagouri around much of its shoreline. This can be avoided by carefully wading a few metres out into the lake. Be warned, you can go out only a couple of metres before it gets too deep! 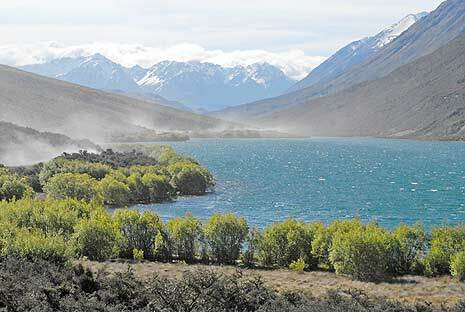 Lake Selfe is situated approximately 90 minutes drive west of Christchurch. Recommended tackle: 7 weight fly rod, floating line and beetle imitations after Christmas. Cicadas in February. Hammils Killer and Mrs Simpson are always effective bully patterns on Lake Selfe. Also well worth trying is a Woolly Buggar in olive green or brown. Rainbows especially will take a variety of spinners, notably green Tillin’s Cobra. I have also had recent success with green and gold Tassie Devils. You will find that the rainbows often jump when hooked. This often leads to them throwing the hook. The best counter is to remove the through-wires from your Cobras and Tassie Devils. Run your line down through the lure and tie it to a small split-ring, on to which your treble hook is attached. 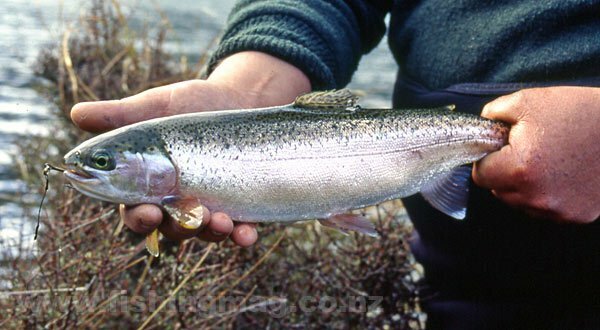 Then when a rainbow trout jumps the lure will slide down out of the way preventing the fish using it as a lever! 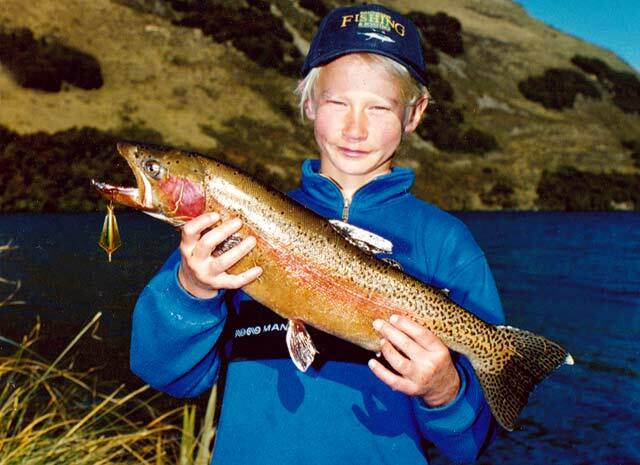 Pieter with his rainbow trout taken spin fishing on a black and gold Toby. Well, this is just my story in short. I’m a migrant from South Africa and I’ve been living here in New Zealand for just over one year. I am a registered member on your site and tried just a couple of times to catch a salmon at the Waimakariri River last season, but the salmon run does not live up to the name “run” as we are used to the Sardine run back in South Africa! My wife, my 2 girls aged 6 and 10 and I decided to go camping last weekend and enjoy the beauty and tranquillity that I believe only New Zealand can offer. We drove to Lake Coleridge but were greeted with a very “angry” and strong Norwester – after this weekend I can now see what all the “fuss” is about this wind. We decided to camp on the southern side of Lake Selfe behind some bushes to try and stay out of the wind. We were the only ones there and apart from the odd car going past we did not see many people around us for the whole weekend. I only went down to the lakeside a bit later in the afternoon even though the wind was very unpleasant. After a while, I gave up and went back to make dinner. We saw a lot of these smaller fish washed up on the shore. Can you identify this fish and the probable cause of its death? We picked up around 15 of these little dead fish. Can you maybe identify these little fish and the likely cause of their death? If you know the answer please send me an email. I have done quite a bit of small boat fishing on Lake Selfe using the Porta Bote over the years. You are not permitted to use a motor for trolling on this water. A green and gold Kobra no.10 is very effective trolled well behind a rowed boat on this lake. Bibbed minnows are particularly deadly on the big rainbows trolled behind a rowboat. The stop-start rowing action adds plenty of life to the lure. A kayak is also very useful on Lake Selfe and saves a lot of walking around this long yet relatively narrow water. Even though this is a small lake it can gut up very rough when the nor-west wind gets up in the afternoons over summer. It is about 20 metres deep in the middle and should not be taken lightly. This reminds me of a funny incident some years ago when two young blokes, whose names I won’t mention, had been fishing on the Lake Selfe from their plastic rowboat. They pulled it on to the bank and were standing around talking while I was making a cup of coffee and a bite to eat. I turned around and noticed that their craft had been blown out onto the lake and was about 50 metres from shore heading towards the opposite shoreline. The site of this unmanned ghost craft out on the lake was an eerie sight. It took well over an hour for them to get their boat back. I drove them in my 4×4 truck to the end of the lake. From there they had to walk quite some distance along the opposite shoreline to retrieve it. Perhaps a good lesson learnt to make extra sure to secure your craft with a rope even if doing so seems unnecessary! I have also seen a few anglers using float tubes on Lake Selfe. This water is well suited to their use and greatly improves access as thick scrub drops down to the water’s edge in most places. The surface water temperature in Lake Selfe can reach 20 deg C during January. On a cold day in high summer, you can put your hand in and it feels like warm tap water. Lake Selfe and the smaller Lake Everlyn on the Harper Road. 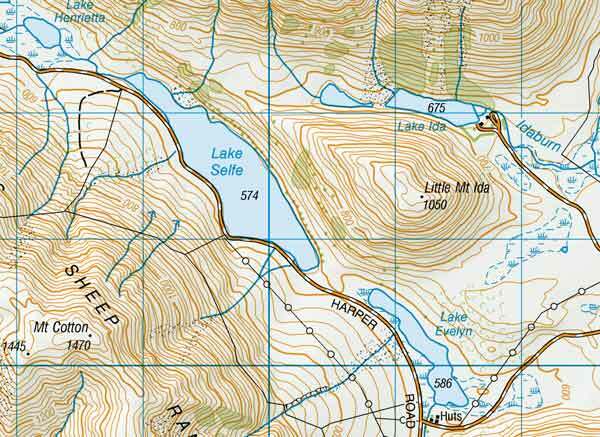 Lake Selfe in relation to Lake Coleridge on the map. Map: 1:50,000. Each grid square represents 1 km. Map Sourced from NZTopo50-BW20. Crown Copyright Reserved. Lake Selfe on the Harper Road. Map GoogleEarth and DigitalGlobe. Click on map to enlarge. Below: Here is a very short video about spin fishing at Lake Selfe.